The claim that English is spoken by the largest number of people of the world is largely contested by the Chinese who affirm that Mandarin, which is the main spoken language of China, has a linguistic following far exceeding the number of people speaking English.Today, English is the link language among different semi-educated and educated linguistic groups in the whole world. It is the language of opportunities. Most jobs require a good knowledge of English. A person who wants to become a successful English speaker must have a strong desire to achieve his aim. To develop a strong and persistent desire, you must inculcate an enthusiasm in yourself for the study and the practice of the subject of English.You must realise the immense benefits which will accrue,if you become a good speaker.The power of speech will give you a great pleasure and a new confidence in your personality. Before you start speaking you must have a thorough knowledge of the subject of your talk. The knowledge of your subject matter will equip you with the confidence to talk with authority before your audience. You should deliver a talk only when you know that you have some thing to say on the subject. The third qualification which a speaker must have is to speak confidently. A speaker must develop the courage to face the audience. Even deep breathing for a few seconds just before facing the audience can prove to be a good morale booster for you and will cheer you up. While facing the audience you must act bravely and confidently. There sholud not be any iota of nervousness in your mind. For this purpose you must practise acting fearlessly and couragelessly. One must try to develop the qualities of boldness, courage and confidence continuously. Try to develop these qualities through sheer practice. It is rightly said that practice makes a man perfect. For this purpose you must practise continuously. There is no substitute for practice. For this it is essential that you must grab every opportunity of speaking English which comes in your way. This real life experience will give you the best practice. Of course, to achieve sure success you must practise speaking English by yourself a number of times, before you speak to anybody. Although it is said that nothing succeeds like success yet it can be said that determination is the guarantee for a sure success. For this purpose you must have determination in yourself and you are going to master the art of speaking good English by your will power. The next qualification essential for a successful speaker in English is that he must have a good vocabulary. Words are power. To become a powerful speaker in English one must increase his word power. For this purpose, it is essential that you must develop the habit of consulting a good dictionary, as well as increasing your word power, with the help of good books on vocabulary. By employing the above mentioned points anybody can become a good speaker in English. Okay – so the above sentence is a little exaggerated but it’s a good example of the difficulties facing those who want to know how to speak English fluently. You see, slang terms and poor grammar become embedded into a language, meaning that whilst you indeed need to study the theory of a language, once you grasp the basics then actually getting out there and talking to those whose mother tongue is English is simply the only way to become fluent. So let’s take a look at the best ways in which you can do this. Study the relevant material. Many people use English study books as their core learning material. However, these give a distorted view of how ‘real’ English is spoken. Sure, they’ll be grammatically correct – but in all reality, that’s not how the language is spoken in practice. The same goes for studying news articles. Although these are good to read, they’ll be written in a formal style that doesn’t particularly show you how the language is spoken in day to day life. Forget the grammar. Well, not forget it completely, but when studying how to speak English fluently it’s important to understand that most people don’t talk in a grammatically correct fashion. In fact, those who learn English as a foreign language probably know more about the rules of grammar than most of those who are native English speakers. Studying grammar too in-depth will only serve to confuse you and slow down your efforts to become fluent. Practice speaking – reading and listening alone are not sufficient to lead you to your goal. After all, becoming fluent is all about speaking the language, not your ability to listen and read. So speak English, whenever and wherever you are, to anyone who’ll listen. And if you’re reading, say the words out loud. It’s only by doing this that the words will begin to come naturally and help you towards your goal. Don’t forget to learn phrases. Whilst learning individual words is great, it’s only by learning phrases that you’ll be able to easily create many different sentences. And that’s key when you’re wondering how on earth you’re ever going to speak English fluently. When children learn to speak they absorb both words and phrases, and this is the very best way to learn – so do your utmost to remember as many phrases as possible. Speak English with English speakers. The very best way to learn to speak English fluently is to surround yourself with fluent English speakers. Submerging yourself totally into the language is the most effective way of learning. So if you’re in the UK – talk to the locals. Don’t surround yourself by people who speak your own language as this simply won’t work. If you want to become fluent, then you need to speak to those who are English speakers as much as you possibly can. Most of all – keep trying. Learning how to speak English fluently won’t happen overnight. But if you keep at it, every day, you’ll soon be surprised at how good your English speaking has become. A language is one most significant aspect of life. People of the same culture are able to communicate to one another with language, in which fact one is able to express how he or she feels about a certain thing, or perhaps to a person. In other words, language plays a vital role in a day-to-day life of a person, as it makes connection among other people. Without it, everything could have been out of order, or in great chaos. English language is widely considered as a secondary language in all nations of the world. Many countries have spoken it for decades already. English is like an invisible bridge that creates linkages among the diversified people who come from varied cultures. That is why, many of us are trying to learn English in the best way possible, as it is the only language in which people across the world are able to understand one another. Unluckily, too many non-English speaking countries have no access to quality education to learn English. In fact, students in schools are bombarded with English textbooks and are required to memorize hundreds of vocabularies in which students will easily forget later on. Apparently, this will not simply work for most of them. There are many ways in which non-English speakers learn real English. Traditional approach requires: first, read many books. Second, learn grammar rules slowly and deeply. Lastly, practice writing and speaking English. Another most effective way of learning English is to simply copy how Americans learn English. To begin with, they do not delve into studying grammar rules yet they are very fluent in English. They memorize vocabularies less often, but they know which word goes naturally with others. Most of all, they speak English correctly without minding so much about grammar rules. But, nothing can equal the convenience of learning English online with the guidance of a guaranteed expert in the language. Learning English online is a new method of learning the language, since not all schools in many countries can provide the right knowledge and exercise for the non-English speakers to learn. 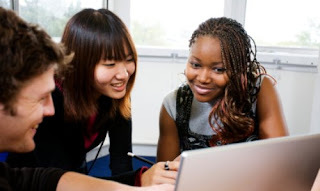 Unlike the regular class in the classroom, online teachers can closely guide the student in the course of learning, as the session is usually done one on one. There is no need for the student to attend English classes daily, and no more unusable textbooks. Only one’s willingness is what it takes to speak and write English fluently. Another advantage of learning English online is that you become more focused on the subject matter; fewer distractions, the more concentrated you will be, and more concentrations would mean better learning you can get. Learning English online is indeed the most accessible way of learning English for those people who want to learn it in the best way possible. Always wanted to learn a language but think you are too old, not talented enough, or just too busy? Think again! Language learner extraordinaire and creator of Fluent in 3 Months – Benny Lewis – gives us his top tips on how to pick up the local lingo fast. If you plan to use your language with human beings and not just for exams, then put aside the books and perfectionism. Grammar does NOT help you to speak a language – it helps you to improve your language skills. You MUST make mistakes and lots of them. Embrace this and you will learn quicker and get your point across more efficiently. When you are ready for it, and very comfortable using the language then it's a good idea to come back to such materials to tidy it up. No more waiting! People are always over-preparing until that day when maybe they'll be ready. This logic is faulty as there is always something missing, so you'll never, ever feel 100% prepared. The only solution to this vicious circle is to get out of it entirely. Speak right now – even if you have only learned a one or two words and phrases! It will be hard to begin with, but you will progress much quicker! The one book I do find terribly useful when I want to speak a language as soon as possible is a cheap, pocket, travel phrasebook. Lonely Planet, Berlitz or any similar book will do the job. Read the phrases and learn them off by heart. If you sing along with phrases it becomes a lot easier to apply them to memory. Then use them immediately. There is a free program you can download to your computer called Anki. It allows you to download pre-made decks with the most common/important words of your target language. You can study on your computer or use a portable version of the app on your smartphone. • Use the site couchsurfing.org and instead of searching for a couch, simply search your home city with just the criteria of the language you want. Message that person to meet up for a coffee. People on this site are very open-minded to meeting strangers. • Ask your friends, local library, church, clubs or anywhere else you can think of to find a local community or speaker of that language. Then just take the leap and say ‘hi!’ to them. 6. Don't think so much – just do it! One of the major issues so many people have when starting to learn a language is confidence. They dwell on the many ways things that can go wrong, and remind themselves how stupid they are. Clear your head and just open your mouth. You are exaggerating how badly things will go – just let the language flow, and use whatever techniques you are comfortable with for relaxing and feeling more confident. Remember – mistakes don’t matter; most locals love it when foreigners make the effort to communicate in their own language (rather than just barking English at them!). 7. Have fun and enjoy talking! You are communicating with another human being in an entirely different language! That's what it is for after all. You can't go wrong with this – it's not like in school where a certain number of errors earns you a fail. You are simply explaining your thoughts, asking questions and enjoying this wonderful new way to communicate. Mistakes and nervousness, and excuses that it's hard can't get around the fact that by simply saying the words, you ARE communicating in that language. There will be many challenges, but you can find a way around them. Good luck, and enjoy speaking! Benny Lewis is a language hacker and technomad, who has been on the road for almost a decade. He blogs about his language learning missions at http://speakfromday1.com to encourage others to learn languages quickly and efficiently, and wrote in greater detail about how he does it in his Language Hacking Guide, the sales of which help support his travels.